The Enata Foiler is an evolution in motor yacht design with its hydro-foiling system effortlessly flying the yacht 1.5m above the waves. Stable and smooth in flight, Enata has designed the foiler to deliver the comfort of a luxury yacht with the performance and handling of a super car. Sicomin has worked with Enata since 2016 and was the natural choice when it came to the selecion of epoxy resins for the project. 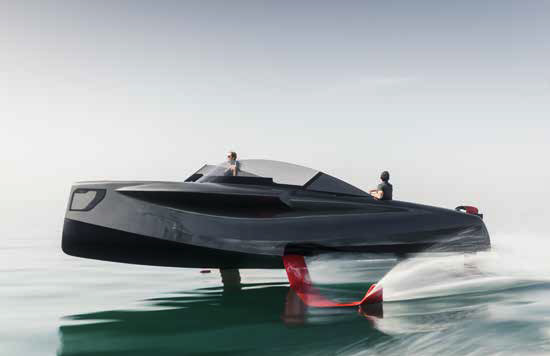 Its four patented foils enable the hull to fly 1.5m above the water, providing a comfortable ride at full speed and allowing the foiler to make smooth and speedy turns, much like you’d expect from a supercar. The fully retractable foils, which do not intrude or impact on the living space, also give options for more ‘conventional’ motoring at the touch of a button; and with the foils retracted when moored, care and maintenance of the system is straightforward. 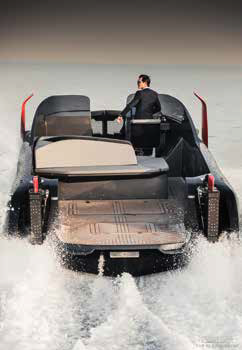 The propulsion system comprises twin 300HP diesel/electric hybrid engines, which work with custom electric torpedoes, providing different fuel configuration options when driving, and working with the foils to provide the impressive lift at up to 40 knots and in varying weather conditions. Enata’s philosophy is defined by high performance, and to achieve this across all their applications - from World Championship-winning aerospace designs to kite foils to architectural projects – designs are underpinned by advanced composites technology. The clear construction choice for the Foiler was infused carbon fibre and epoxy resin. Carbon fibre provides high strength and stiffness, particularly required for the four foils, and enables the construction of a lower weight hull allowing full lift to be achieved with the hybrid drive system. This performance wouldn’t be possible with a typical heavier E-glass structure. Enata chose Sicomin’s advanced epoxy infusion and laminating systems for the hull and structure of the Foiler, combining excellent mechanical performance with optimised processing characteristics. Epoxy resin is stronger than alternative resin types, has good fatigue performance and durability, and is proven to work well when combined with carbon fibre in highly loaded structures like the Foiler. Sicomin’s SR8100 epoxy system was used, having been specially formulated for resin transfer processes such as injection or infusion. The system has a very low viscosity at ambient temperature and can be used with different hardeners for the moulding of small or large parts, with fast demoulding time. In addition, the Germanischer Lloyd certification approval for the SR8100 resin system provided Enata with further validation of the quality and consistency of Sicomin’s products.